Sarah Moschenross, dean of students at Grinnell College since 2015, is being promoted to associate vice president for student affairs at the College this summer. Moschenross will oversee all aspects of student affairs including the dean of students, campus safety, international student affairs, intercultural affairs, religious life, residence life, student activities, student assistance, wellness, and student health and counseling services. Moschenross succeeds Andrea Conner, who will leave Grinnell in June to become vice president and dean of students at Lake Forest College in Lake Forest, Illinois. Conner has served Grinnell since 2009, demonstrating exceptional leadership in enhancing intercultural affairs, campus safety, and student health and counseling. Before coming to Grinnell, Moschenross was director of the Ronald E. McNair Postbaccalaureate Achievement Program at Knox College in Galesburg, Illinois. In that role, she mentored, advised, advocated for, and counseled underrepresented, low-income, and first-generation college students. Grinnell College helped celebrate the Thomas J. Watson Fellowship’s 50th anniversary in 2018 by inviting Grinnell’s Watson alumni to campus. One part of the celebration included a “slam” event at Spencer Grill with alumni sharing their Watson journeys in brief presentations. *Senior faculty status recognizes those faculty members who are released from regular, full-time teaching obligations to pursue scholarly and professional activities associated with the College. Read more about Congratulations, Faculty! Mélanie Marcel, founder and CEO of SoScience, is the recipient of the 2018 Grinnell College Innovator for Social Justice Prize. In her work as a laboratory scientist, Marcel realized that researchers most often conduct projects for which they can secure corporate or government funding, rather than projects that address community or environmental needs. During Grinnell Prize Week, Oct. 1–4, 2018, students, faculty, staff, and local residents will interact with Marcel, learning how to facilitate collaboration, build partnerships, and spur systematic change. The award ceremony will be held Tuesday, Oct 2. at the College. The $100,000 Grinnell Prize, established in 2011, is the largest given by any U.S. college in recognition of social justice. The prize money will be divided between Marcel and SoScience. Full schedule of events to come at www.grinnell.edu/grinnellprize. 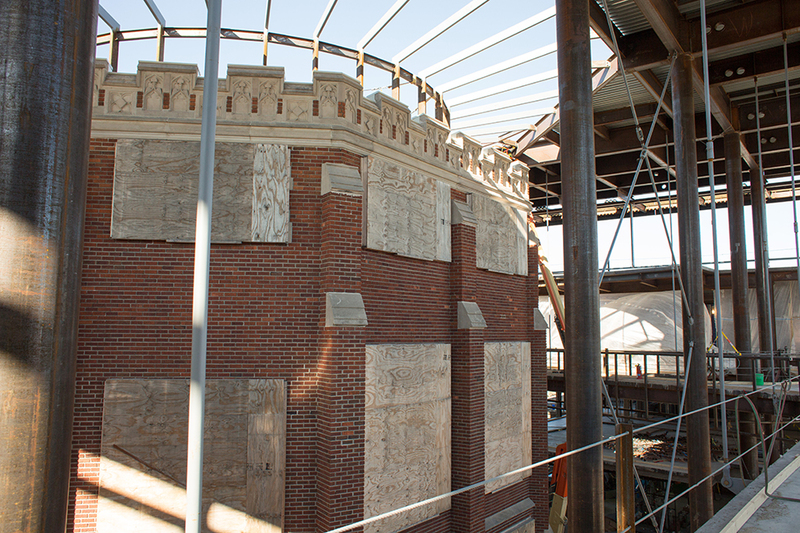 The east side of Alumni Recitation Hall (ARH, originally opened in 1916) and Carnegie Hall (opened in 1905 as the College library and used since the 1950s for classrooms and offices) are being enclosed by a new structure. In this photo from the front of the Noyce Science Center, the top of ARH can be seen next to the pillar supporting the crane. The completed complex consisting of the new construction and remodeled ARH and Carnegie will be known as the Humanities and Social Studies Center (HSSC). Exterior of the upper levels of the two-story lecture hall inside ARH. North wing of the HSSC seen from inside what will become the glass atrium. How do our readers think we’re doing with The Grinnell Magazine? That question was the main focus of a reader survey conducted by Grinnell’s Office of Analytic Support and Institutional Research for the Offices of Communications and Development and Alumni Relations in October and November 2017. Survey invitations were emailed to 15,313 people who receive the magazine; 1,862 people, 12.2 percent, responded. In spring 2015, the College conducted a reader survey to gather feedback and solicit ideas for a planned redesign of the magazine, which was implemented with the fall 2015 issue. Two years after the redesign, the magazine staff wanted to see what changes resonated with readers. We listed 10 new or significantly modified sections of the magazine and asked readers whether they read them regularly, occasionally, or never. We also asked survey respondents which of our regular, unchanged departments they read regularly. Classnotes (35 percent), letters (26 percent), and the Iowa View photo on the back cover (22 percent) received the most responses. To get a sense of whether we’re writing feature stories our readers want to read, we presented a list of six stories from the Spring or Summer 2017 issues and asked which ones people recalled reading, skimming, looking at the images, or skipping altogether. “Portrait of a Teacher: George Drake ’56,” a Summer 2017 cover story, was the runaway top vote-getter, with 57 percent of respondents saying they read it and 30 percent skimming it. The next top story, also from the summer issue, was “Excavating the Peace Rock,” with 39 percent saying they read it and 32 percent skimming it. The least read story of the six was “Studying Arabic for Fun” from the Spring 2017 issue. About half the respondents said they read or skimmed it but 35 percent said they skipped it. We also asked several open-ended questions soliciting readers’ views on the following: the “Campus News” section, a memorable article or topic from the last year, what readers like most and least about the magazine, and story ideas or suggestions. Respondents were generous with their answers, which totaled about 70,000 words, or the length of a novel. Whether the feedback was positive or negative, we’re taking it all in and will use these results in a couple of ways. One, to help us make some modest changes to our content. For example, we’re trying a new “Campus Notable” profile in this issue; see Page 41. And two, to reflect on what we can improve on and what we’re doing fairly well, such as choosing topics and stories of interest to a wide range of our readers. Jackie Brown, professor of biology, and Lesley Wright, director of the Faulconer Gallery, have teamed up to curate an exhibition that explores the relationship between visual art and biology. On display at the Faulconer Gallery until June 10, Making Life Visible: Art, Biology, and Visualization takes its inspiration from Brown’s research with former student Idelle Cooper ’01 on Hawaiian damselfly color. Both the research and the exhibition are funded, in part, through a National Science Foundation (NSF) grant awarded to Brown and Cooper. “Every NSF grant is evaluated in terms of both its intellectual impact and its broader impact,” says Brown. When he and Cooper applied for funding for their damselfly research, they thought carefully about how they could engage the community with their work. Cooper, who double-majored in art and biology at Grinnell, suggested that the grant could be the perfect opportunity to showcase how artistic practice and biological research intersect. Currently an assistant professor of biology at James Madison University, Cooper frequently uses her own art to visualize her research; drawings from her postdoctoral work on sticklebacks and previous research with Brown are included in the exhibition. Brown and Wright also saw a chance for the exhibition to build on their history of collaborative teaching about the history and potential of the art/science interface. When designing Making Life Visible, Wright and Brown wanted to ensure they represented a broad range of biological inquiry in various artistic mediums. To this end, they enlisted the help of Julia Shangguan ’18, a studio art and biology double major, to research potential artists for the exhibition. Shangguan also participated in Brown’s Hawaiian damselfly research (see “The Essence of Inquiry,” Spring 2016, Page 25). “It was exciting — and reassuring — to see that many individuals already recognize the beauty of an arts and sciences union,” Shangguan says. With the help of Rita Clark ’18, Wright and Brown settled on 16 contemporary artists and scientists, with pieces ranging from Dutch portrait-style photographs of insects to charcoal sketches of bones to neurons micro-etched in gold. The exhibition also includes works from naturalists of the 16th–19th centuries, putting the connection between art and science in its historical context. “In the past, artists were often trained in observation, and scientists were trained in drawing, because they had no other way to record what they saw,” says Wright. How naturalists chose to represent their subjects could influence how those subjects were perceived. Along with being a great opportunity for an alum, biology professor, art curator, and current students to work together on their shared interests across disciplines, Making Life Visible challenges gallery-goers to see something as humble as a honeycomb in a new light and question the divide between art and science that many take for granted. Artwork courtesy of the artist, Tara Shukla, Skull, 2016, charcoal on paper, 30 x 22 inches. When Brendan Hyatt ’21 began his college search, he knew that he was looking for a school with small classes and an open curriculum. Beyond that, where he would end up was anyone’s guess. After touring several colleges, Brendan flew out to Iowa to visit Grinnell. Though he had lived in cities all his life, it didn’t take long for the New York and Washington, D.C. native to feel right at home. “There was a warmth that emanated from the campus and the students who were here, I could see it in the way people were interacting,” he says. Grinnell’s academics were another deciding factor. With just one required class, students have the freedom—and responsibility—to approach their curriculum with intention. Brendan was looking for a college where he could walk into any class and know that students were only there because they truly wanted to be there. He found it at Grinnell. Convinced that Grinnell was the college for him, Brendan decided to apply Early Decision. One month into his first semester on campus, he is confident that he made the right choice. Read more about Can you see yourself here?